As the manufacturer of Graphium’s Web transport and hybrid print and converting features, UK and Ireland customers will greatly benefit from Edale’s expertise and knowledge of both Graphium and the evolving UK label market. FFEI Ltd, the global developer of award-winning digital imaging solutions, today announces an exclusive partnership with Edale Ltd, for the sale of FFEI’s Graphium hybrid digital inkjet label press in the UK and Ireland. “Developing the web transport, hybrid print and finishing technologies for Graphium over the last two years with FFEI has resulted in significant productivity advances. With our extensive product knowledge and established and loyal customer base, becoming UK and Ireland distribution is the natural progression for Edale” comments James Boughton, Edale Managing Director. “Closer cooperation between FFEI and Edale’s technology and engineering partners has resulted in a hybrid label and packaging solution that features the very best inkjet engine, flexographic print, automated finishing, workflow, and all this as a fully integrated package.” Boughton concludes. A Graphium hybrid digital inkjet label press combines the efficiency of digital label production with the flexibility of flexo. It enables each graphic element to be produced by the most efficient process, be that digital or flexo. Shorter run jobs can be printed purely digitally, maximising the efficiency and time saving qualities of digital. For much longer run lengths efficiencies can be maintained by printing dominant colours, such as key brand colours or white, as flexo spot. Whilst Edale and FFEI build each press jointly, Edale will be responsible for managing UK and Ireland sales, technical support and servicing. 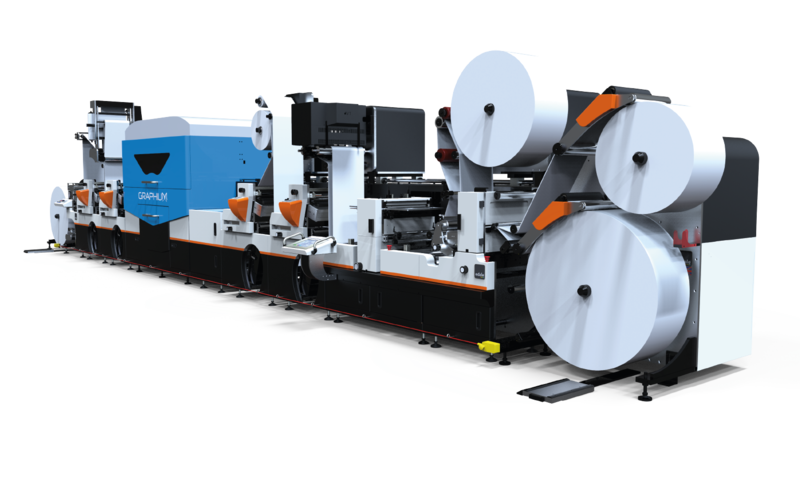 Edale builds to order the conventional press frame, based around its FL-3 press, including flexo and converting units. The Graphium digital unit is then added and the final press assembled and tested by Edale. Cook continued, “Ink formulation is also key to the reliability of the system. Fuji has worked hard to ensure their ink technology gives maximium system reliability especially in combination with, the Xaar 1002 heads we use. Having Fujifilm as a partner is instrumental in optimising the Graphium press for its exceptional levels of reliability to make it a true ‘workhorse’ production machine”. Graphium will be demonstrated on Edale stand 7D43 at this year’s Label Expo in Belgium. It will feature two pre digital and two post digital UV flexo stations, a six colour Graphium inkjet print engine, hybrid semi and full rotary die cutting with auto die load, autoset slitting and a twin rewind. Further details on the show configuration to follow in the coming weeks. Graphium hybrid digital inkjet label press will be printing a range of ‘hybrid’ samples to demonstrate its unparalleled application versatility and reliability.